Participants with autosomal dominant polycystic kidney disease (ADPKD) demonstrated higher carotid-femoral pulse-wave velocity (CFPWV) compared with healthy controls (P<0.01), without a statistically significant difference in brachial artery flow-mediated dilation (FMD) (P=0.08). (A) CFPWV and (B) FMD in participants with ADPKD and healthy controls are shown in black and white bars, respectively. Values are mean±SEM. *P=0.007. 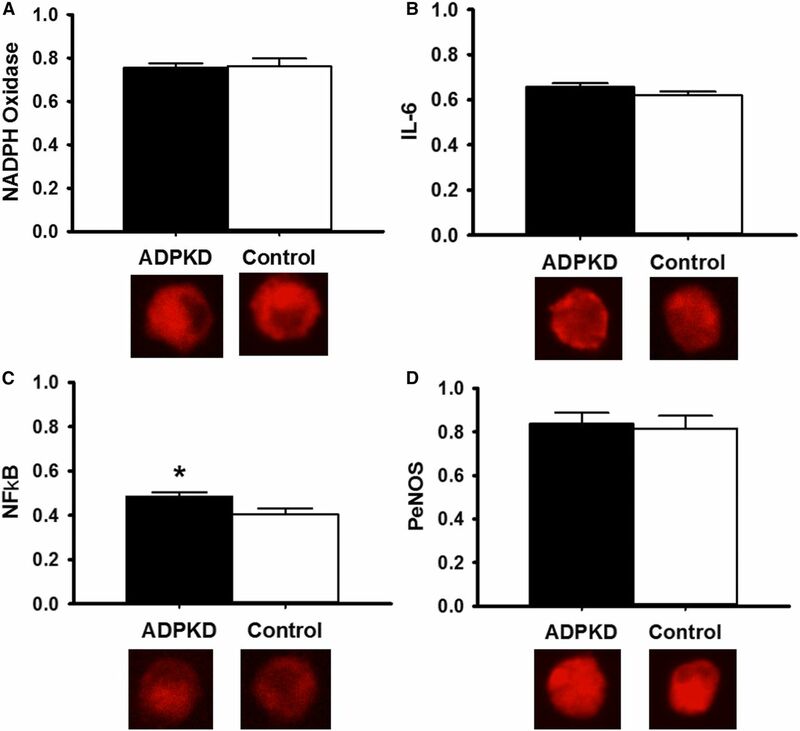 Vascular endothelial cell protein expression of the pro-inflammatory transcription factor NF-κB is increased in participants with autosomal dominant polycystic kidney disease (ADPKD) compared with healthy controls. 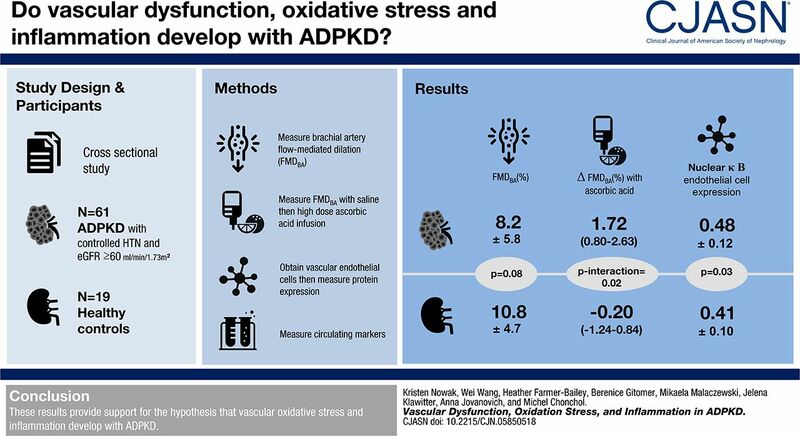 Protein expression of (A) NADPH oxidase (ADPKD: 0.75±0.14; control: 0.76±0.15; P=0.86), (B) IL-6 (ADPKD: 0.66±0.11; control: 0.62±0.11; P=0.26), (C) NF-κB (ADPKD: 0.48±0.12; control: 0.41±0.10; P=0.03), and (D) phosphorylated endothelial nitric oxide synthase (PeNOS; ADPKD: 0.84±0.28; control: 0.81±0.18; P=0.82) in vascular endothelial cells collected from a peripheral vein of participants with ADPKD (black bars) compared with healthy controls (white bars) Expression (by quantitative immunofluorescence) is relative to human umbilical vein endothelial cell control, with representative images shown below. Values are mean±SEM. *P<0.05. Data are mean±SD or n (%). ADPKD, autosomal dominant polycystic kidney disease; BMI, body mass index; CKD-EPI; Chronic Kidney Disease Epidemiology Collaboration equation; ACEi, angiotensin-converting enzyme inhibitor; ARB, angiotensin receptor blocker. ↵a P<0.05 by chi-squared test or Fisher exact test for categorical data and independent sample t test for continuous variables. Data are mean±SD or mean (95% confidence interval). P interaction (group × condition) =0.02. FMDBA, brachial artery flow-mediated dilation; ADPKD, autosomal dominant polycystic kidney disease. Data are median (interquartile range). P values are independent t test comparisons between groups using log-transformed variables. ADPKD, autosomal dominant polycystic kidney disease; hsCRP, high-sensitivity C-reactive protein; PG, prostaglandin; HODE, hydroxyoctadecadienoic acid; HETE, hydroxyeicosatetraenoic acid; EET epoxyeicosatrienoic acid, HEPE, hydroxyeicosapentanoic acid.